The chilong is possibly the most popular design on early glass overlays, and is one of the most difficult of beasts to date through the evolution of its style alone. This color combination is an extremely rare one, although many of the same subject are known in other color combinations, the most common being ruby-red on colorless or white glass. Compare a similar bottle with blue overlay on a snowflake ground in the Denis Low Collection and illustrated by R. Kleiner, Treasures from the Sanctum of Enlightened Respect, pl. 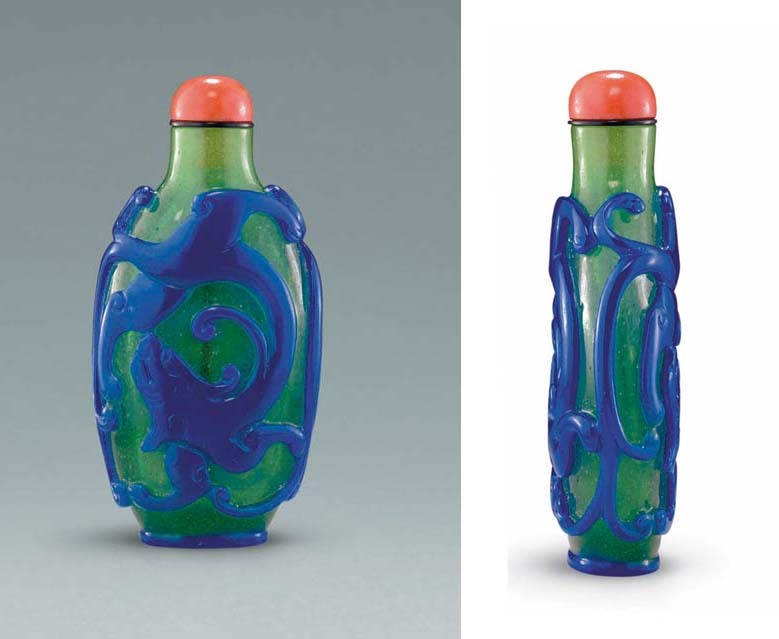 96; another formerly in the J & J Collection and sold in these rooms, 30 March 2005, lot 20; one formerly from the collection of Jean and Saviere Pigoreau and illustrated in the exhibition catalogue, Robert Hall, Chinese Snuff Bottles III, p. 13, no. 3; and two more illustrated in Snuff Bottles. The Complete Collection of Treasures of the Palace Museum, pl. 67, with dark blue overlay on green glass, and pl. 68 for an example with red overlay on colorless glass. Another unusual color combination of yellow overlay on red glass is also in the Imperial Collection (ibid., no. 58).